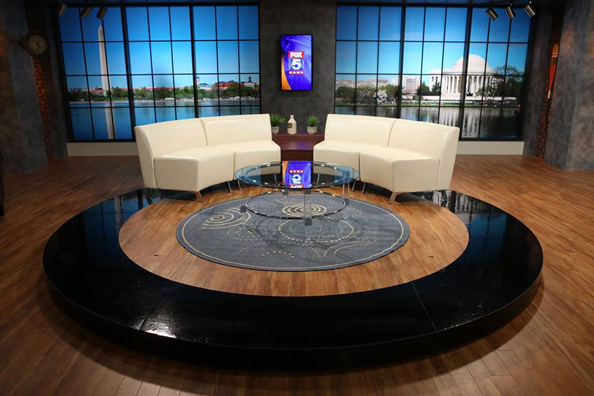 Fox O&O WTTG-TV in Washington, D.C., is prepping to debut a new home for its newscasts: The Loft, designed by Broadcast Design International. 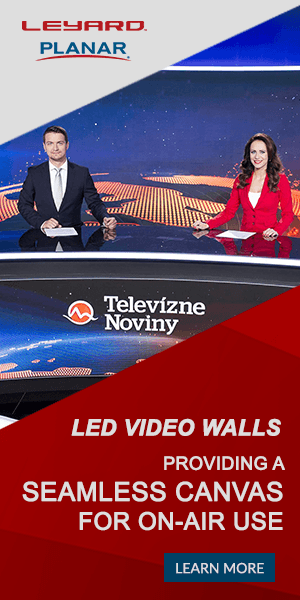 In a drastic move away from the typical set seen for years at Fox owned stations, the new set is a wide open space decked out in, as the name implies, a loft-style look. Curved sofas on a circular riser are situated in front of a wide span of faux floor to ceiling windows. In a nice touch, the view isn’t the typical shot of the Capitol or White House — but instead an over-the-water shot of the Washington Monument on the left and the Jefferson Memorial on the right. Between the two panels of windows is a faux brick wall with vertical flat screen. Other areas include a fireplace with industrial walls and accents that continue the homey feel as well as a brighter wall that conveys the look and feel of a home entertainment center. 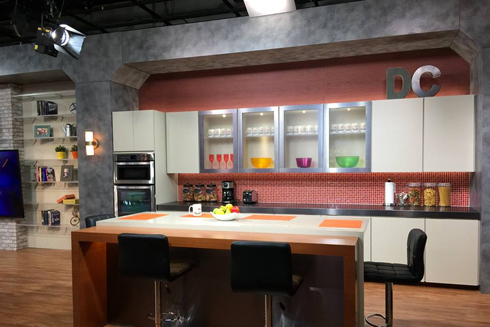 The final part of the set is a working kitchen, which includes modern white cabinetry with four open units in the center that show off coffee mugs and colorful dish ware. A large, blocky island includes seating for four. A continuing theme of the set is the thick textural gray columns and header elements that are perhaps most prominent in the kitchen area. With angled corners, these elements are reminiscent of the chunky reinforced concrete columns and beams found in old industrial buildings turned loft homes. The new look for WTTG-TV is somewhat similar to a new set installed in Charlotte at fellow Fox owned WJZY-TV‘s move to a diner-style set last October and marks another vast departure from the longtime use of nearly identical sets at all Fox O&Os. 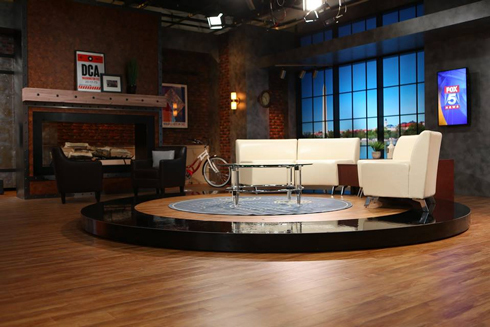 Also last fall, Philadelphia‘s WTXF-TV debuted an overhaul to its FX Design Group streetside studio. That set, which originally debuted in 2006, used a faux metalwork and frosted plexi theme and was, at the time, a bit unique in that it didn’t match the Fox O&O sets being used elsewhere. The station did eventually install a set, elsewhere in the building, that matched the look and feel of other Fox stations.